I may have mentioned before that I like mini bottles. Yes, they can be a bit awkward to work with due to the small caps and stumpy brushes, but for me that's more than offset by the fact that smaller bottles means I can fit more colors in my Helmers. All this means that when I see a mini set in a store, it often comes home with me. 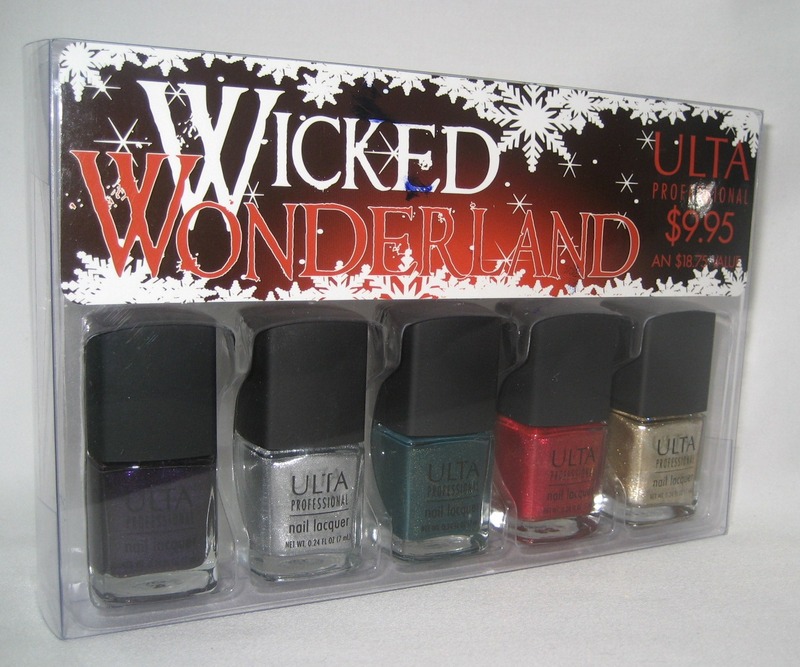 One of the latest additions to my mini collection is the Ulta Professional Wicked Wonderland set, which is five Christmas colors in .24 fl. oz. (7ml) bottles. Left to right: Empty Stocking, Twisted Tinsel, N-Evergreen, Bad Santa, Tilted Halo. 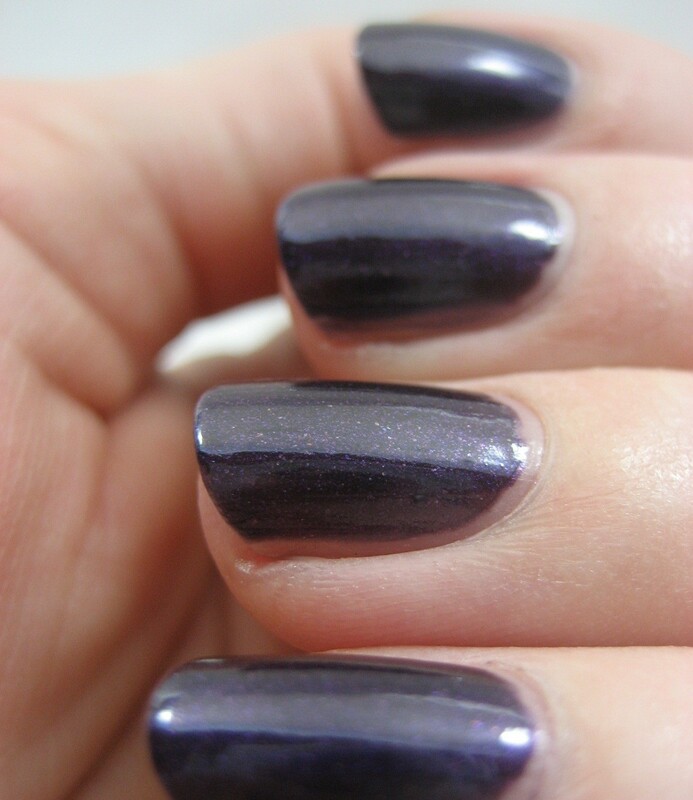 Empty Stocking is a purple shimmer. In real life it's not as blue as it looks in my photos, but the more I tried to color adjust the worse I was making it (and giving my skin a rather alarming sunburnt look in the process). 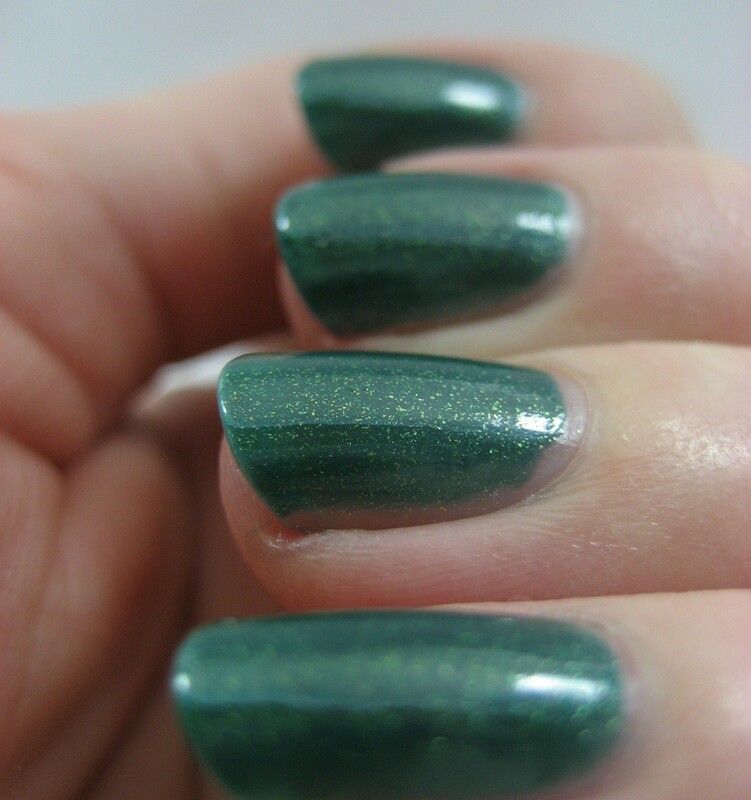 N-Evergreen is a darkish green with gold shimmer. Bad Santa is a red shimmer. 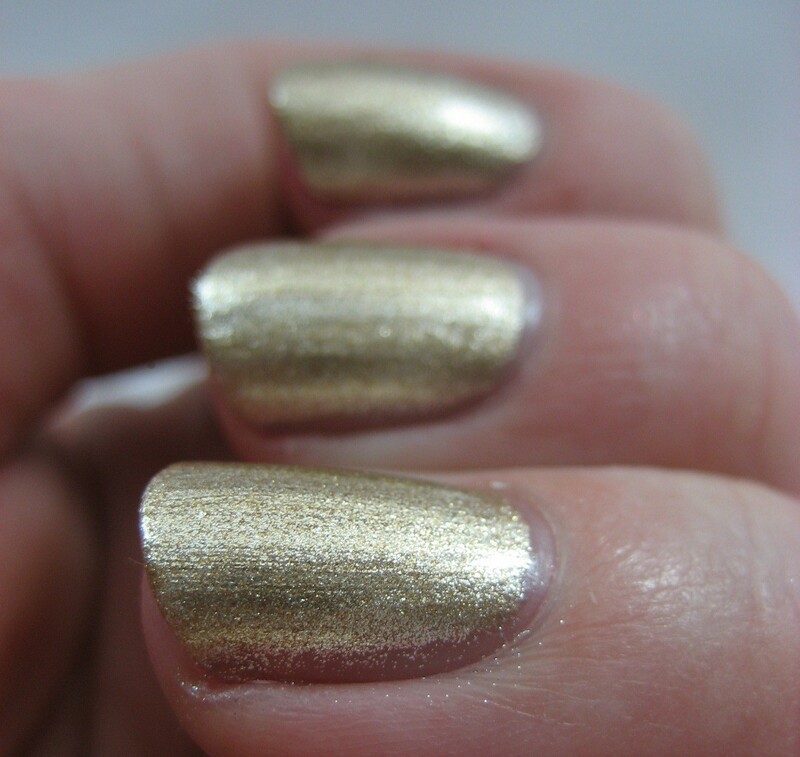 Tilted Halo is a gold foil. This is a nice assortment; you've got a red and green for Christmas, a silver and gold for New Year's, and a purple, which is appropriate for any occasion. However, I likely wouldn't buy all of these colors if they were available individually since I already have dupes or close enoughs in my stash. N-Evergreen is the most interesting of the lot. Do you like minis or would you rather have full size bottles? and yes, I like minis, also! Great swatches! Nevergreen is my favorite from the bunch, too. 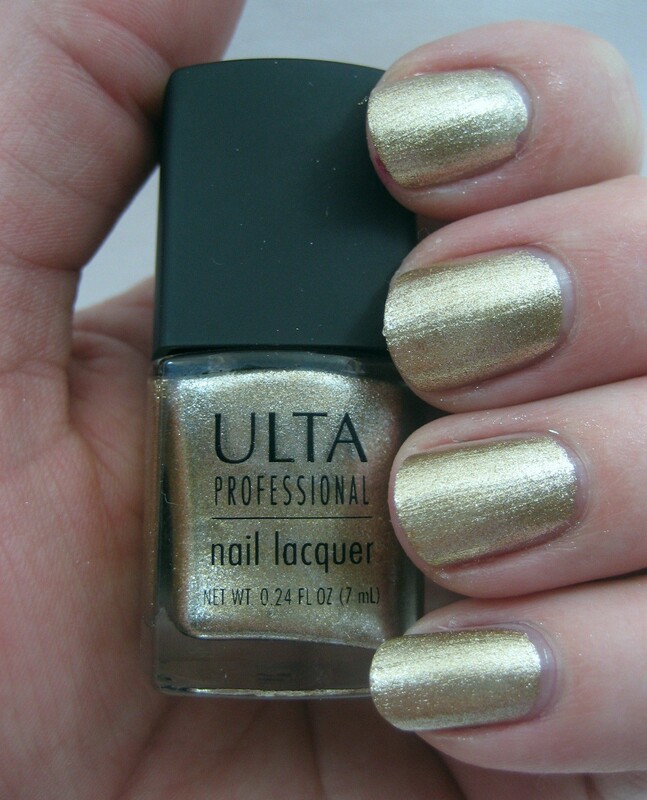 These are good colors, but there isn't any that just scream "BUY ME" (imo). OMG N-Evergreen Is calling me :D I must have it :D Love me some greens. Bad Santa is quite lovely! I wanted to get this during their Black Friday/Saturday madness but never made it. Looks great! I only have one mini...I think that there's more satisfaction with the full-sized bottles. I really like minis...but the thing about them is if you find one of the mini's absolutely stunning...then 7 mL is not enough and I would have to get back up bottles. the problem i have had is when I get a special exclusive set and there is one polish I need back up bottles for..but since it comes in a set I would have to buy the entire mini set and well..i don't want doubles of all the other colors just that one polish..and then i end up with doubles of color I don't want. I haven't seen this set before! 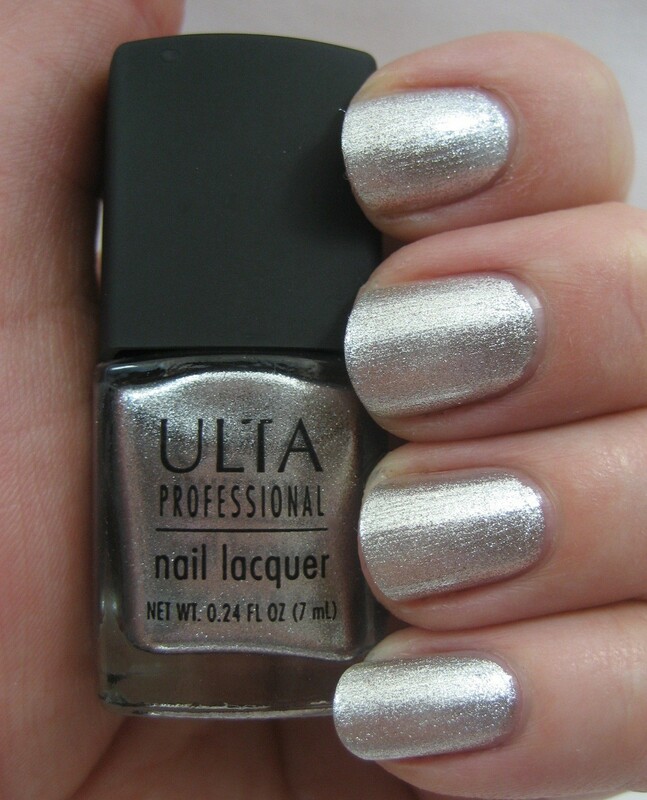 :) The only minis I don't like are the OPI minis. I have a couple in my stash without names and they just seem way too tiny!! For whatever reason, I don't like minis. Someone actually tried to give me a mini bottle of something today at work (cos it was cute) and I rejected it! Talk about thankless! Hehehe. I don't think I have any mini bottles at all in fact! No wait, I just remembers I have a NARS mini set - but that's it! Quite strange actually. I love N-Evergreen! I wish this came in a single full size. I like nevergreen! I like mini's, so you can try them out a few times before you buy a full size bottle, but I'll go crazy when I love a color and they don't have a fullsize bottle of it! I wouldn't be surprised to see full sizes of some of these; they did come out with a full size of For Bitten from the Glam Goth set.